It wouldn't be a new year on my blog if I didn't have a list of products I am eagerly wanting to get my hands on. As like every year I make this promise to myself that I will spend less and then I go and put myself on a spending ban, yes January is my least favourite month as I am on a ban and cutting out sugar, pretty much like 80% of us right? So here are some items I need...yes I said need (not really though). So one of my new rules this year was to stop buying unnecessary makeup. I mean how many naked palettes can you own or how many pink lipsticks do I really need so I said I would only but key investment pieces. 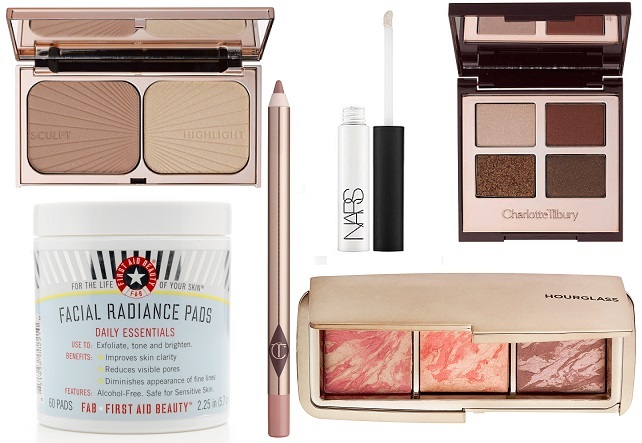 This wishlist is a little Charlotte Tilbury heavy and for that I blame the blogging world for making me want it all. First off is the CT Filmstar Bronze & Glow, I was looking at swatches of this online and it looks so damn beautiful it almost glistens in the palette and I believe this would make a perfect addiction to my makeup bag. The palette itself comes with a nice non muddy bronzer and a highlighter that's been compared to TheBalm Mary Loumanizer which is my all time highlighter so this duo sound dreamy. Next from Mrs Tilbury is the famous Pillow Talk lip liner, I dont even wear lip liner that much but this one looks a real beaut so obviously it made it onto my list and the staying power is meant to be out of this world and lastly from CT is the Dolce Vita quad, I think I have wanted this palette ever since it came out but the price tag has always thrown me off I mean €50 for 4 eyeshadows its crazy so if you have this is is a must buy because it looks so beautiful. Next is from First Aid Beauty I have been loving their range lately and so I have added the Radiance pads to my list as I am dying to try them. I have heard nothing but good things about these little pads so expect them to be purchased soon. From Nars I have wanted the Smudge Proof eyeshadow base as I have heard its great for oily lids so again if you have tried it let me know if its worth getting and lastly of course a year wouldn't be a year in beauty if I didn't crave an Hourglass product. I fell in love with the Ambient Lightening Blushes last year and so I have decided I may aswel get the blush palette, you know its like an investment if you look at it logically. So there is my new year wishlist. Is there anything you are hoping to pick up this year? I am on this ban until I turn 24 (feb 22nd) and then I'm going to treat myself and then put myself back on a ban, 2015 is the year I save money and not waste it but we shall see.